Willie Mullins believes the setback suffered by Footpad at Naas on Saturday might cost the star chaser around a "week or 10 days" but should "not interfere" with his next start. The Arkle Trophy hero lost his unbeaten record over fences when beaten by Saint Calvados in the Poplar Square Chase, making mistakes on the way around and giving Ruby Walsh no chance of keeping the partnership intact at the last. 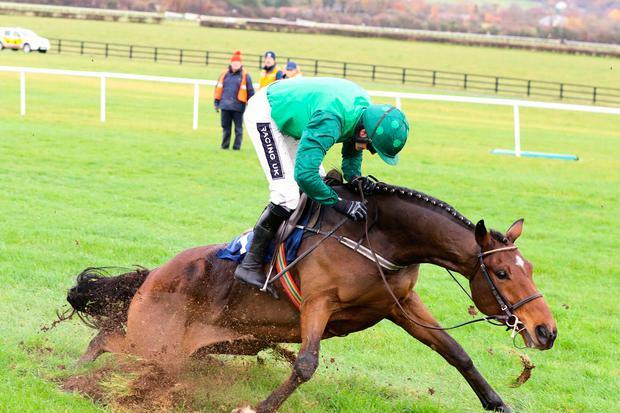 Mullins said yesterday: "Footpad is fine. Hopefully it's just an over-reach. He's very sore. He got a bang on the front of his leg, on his pastern, and he got an over-reach also. "It looks to be just a typical racing injury that will come right in a couple of weeks or less. "I think it must have happened early and he probably was just feeling it because he had schooled very well the day before. "Hopefully it's just a blip and I don't think it will interfere with his next run. It might cost him a week or 10 days." Mullins and Walsh also saw Saldier come down at the last in the Fishery Lane Hurdle, when holding every chance. The trainer said: "Saldier looks like he has broken a bone in his nose. That's going to take a little bit more time, I think. "He's going for a scan and we'll know more about it then and what we'll have to do to fix it. "Hopefully we can fix him as he stands, rather than having to operate.